Here at Ace we put the needs of our customers above all else. That’s why we stock only the highest quality materials and hire only the most qualified and experienced installation experts. Our dedication to quality has been appreciated by many of our customers in Broward and Palm Beach counties, and as such they have volunteered to write a few words about their experiences with Ace. Below, in our clients’ words, are a few reasons why you should hire Ace for your next fencing project. Consider these testimonials carefully, and if you like what you hear, give us a call today. We’re standing by to help you. “My wife and I would also like to express our appreciation for the quality of the work done. The gentleman who did the work was hard working, meticulous and very professional, and left us with a superbly built fence. “Just want to thank you and the rest of the crew who handled my fence install from start to finish. Everyone I dealt with was courteous and professional. It’s nice to finally find a company down here that actually did what they said when they said. It is greatly appreciated. – Mary and Bob C.
“I wish to commend every one from Alex on down the chain. Thanks for your patience. Dante & Fernando worked their magic during the install in spite of the adversity created by my neighbor. The office staff was very prompt in getting my warranty to me. The materials were top quality & the price was reasonable. I get compliments from my neighbors as to how good the fence looks! My thanks to Alex for visiting my job site during install. He had a very stabilizing effect on my belligerent neighbor and the install proceeded to go smoothly. – Johnny H. – Project manager for an engineering firm. 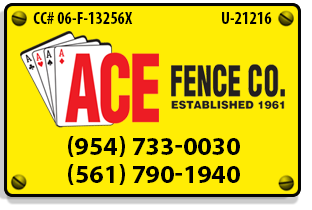 “I am pleased to provide Ace Fence Company with this letter of reference as President of the Board of Directors of The Fairways of Sunrise. We selected Ace to replace the wood fences at our hurricane damaged development because of their reputation and the quality of materials they use. We are a townhouse community which consists of twenty buildings and over one hundred units, all of which suffered major hurricane damage requiring multiple trades to rebuild over a period of several years. Our contractor choices were critical and we could quickly tell if they were the correct ones. Things went smoothly and proceeded at a reasonable speed with Ace. Problems that cropped up were addressed quickly and professionally. Our salesman and the production manager were always available.